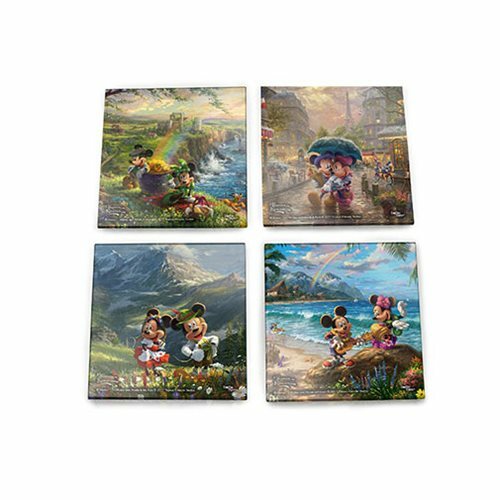 Mickey and Minnie are travelling the world in this delightful Disney Mickey and Minnie Tourists Thomas Kinkade StarFire Prints Glass Coaster Set! Translucent yet vibrant with color, and crafted to offer lasting durability, each of the four dazzling coasters is made of high-quality glass, includes soft pads underneath to protect surfaces, and features a different scene. Also included is a stylish holder for easy storage! Made in the USA. Scenes include: - Minnie wears green-and-white polka dots, while Mickey rests against a pot full of gold in Ireland. - Minnie and Mickey stroll the cobblestone streets of Paris. - Minnie and Mickey enjoy some mountain air in the Alps. - Mickey plays a ukulele while Minnie dances the hula. 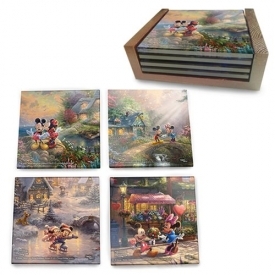 StarFire Prints glass coasters are photographic-quality prints on glass. 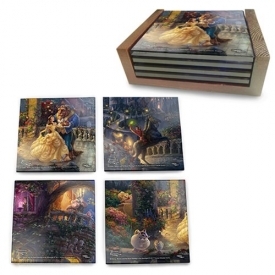 Featuring artwork from your favorite movies, these coasters are an elegant way to display your fandom to the world. 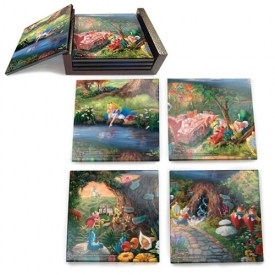 These images are permanently fused into the glass, resulting in a print that captures the natural light, enhancing the color display and making each image a true piece of art. Hand wash only. Not dishwasher safe.